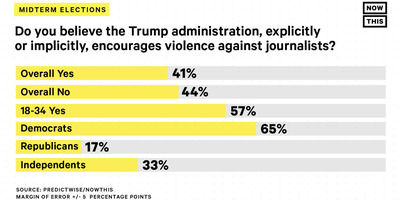 NowThis/PresdictWiseA new poll from NowThis/PredictWise 57% of young adults believe President Trump encourages violence against journalists. 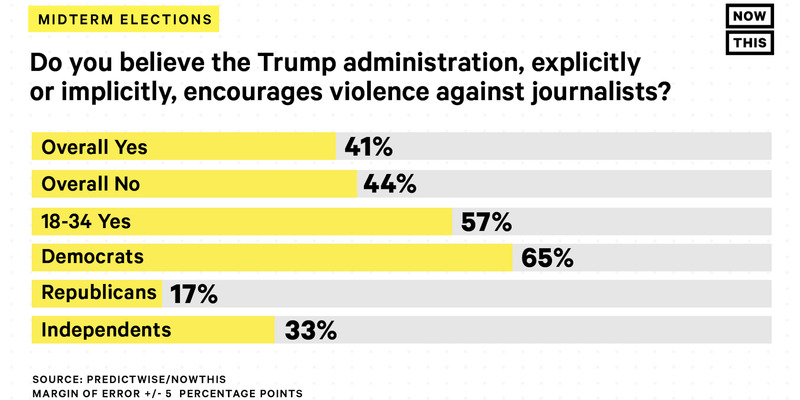 A new poll from NowThis/PredictWise found that most adults believe that President Donald Trump encourages violence against journalists. The poll was conducted on October 23, five days after Trump praised a Republican congressman for assaulting a reporter. The results were released in the wake of multiple bomb scares across the country Wednesday, after several explosives were sent in the mail to top Democrats and Trump critics, including CNN. Most young adults believe that President Donald Trump encourages violence against journalists, according to a new poll released by NowThis/PredictWise. The poll surveyed 750 young adults, ages 18-34, as well as 750 adults ages 35 and older. When asked if they believe the Trump administration, either explicitly or implicitly, encourages violence against journalists, 57% of the younger set said they do. That number was smaller for all adults, at 41%. There was a stark difference in opinion when it came to Democrats and Republicans surveyed. While the vast majority of Democrats believe that Trump encourages violence against the press (71%), just 17% of Republicans agreed. The results were released on the heels of yet another act of terror on the press. On Wednesday, CNN’s New York bureau was evacuated after an explosive device was sent in the mail to the network.Trump has openly and repeatedly lashed out at CNN, and calls it “fake news.” In July 2017, Trump shared an image of himself body slamming a person who had the CNN logo superimposed on his face. Several other devices were sent in the mail to top Democrats and Trump critics including former President Barack Obama, ex-Vice President Joe Biden, and 2016 Democratic presidential candidate Hillary Clinton, among others.